We install a variety of half round gutter systems available in materials such as aluminum, copper, and galvalume. Great Lakes Gutter installs a variety of half round gutter systems including aluminum, copper, and galvalume. Although originally intended for traditional homes, half round gutters systems add beautiful curb appeal to any home or building. Our half round gutters are available in 6" and 8" systems. 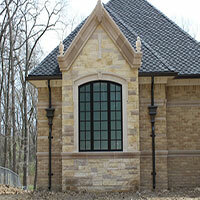 We also install round downspouts in 4" and 5". Round downspouts are available in round smooth or round corrugated. 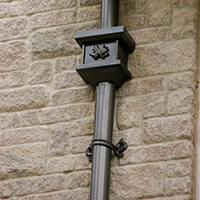 Many decorative accessories are available for our half round gutters including Leader heads, decorative fascia brackets, and several other items.